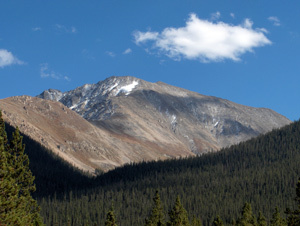 As the summer of 2005 neared the end, I took advantage of a family trip to a Colorado ski resort to climb La Plata. This was not any family trip, it was our wedding anniversary and Ashley, home from UCLA for a couple of weeks, joined us. I promised not to hurt myself climbing on the day before the one of the Big Ones and drove to the trailhead on September 15, 2005 for my solo climb. The ladies went shopping. 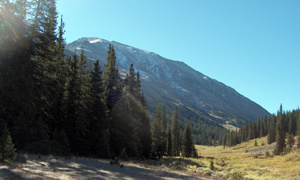 The trailhead for La Plata has to be one of the easiest to locate in Colorado. A huge Park Service sign marks the Lake Creek Trailhead on a gravel pull-off about 15.5 miles west of highway 82 on Colorado 24. I began my walk on the South Fork Lake Creek Road (FS 391) for about a quarter of a mile until I saw the register and the signs that vividly say "Do not drink the water!" It seems that all the mining in the area have resulted in large quantities of "heavy metals" in the streams. One example of such a heavy metal is Arsenic! Leaving the dirt road, the well worn trail works it way though a heavily wooded forest. In a few minutes I reached a solid bridge that crossed the raging South Fork of Lake Creek. It was worth a moment to admire the force of a late summer stream pounding the smooth rock in a very narrow canyon. I wondered what it must sound like in a full spring run-off? A few more minutes took me to a three-log bridge crossing a more gentle stream and soon I was at the end of the flat part of the hike. It was all uphill from here! 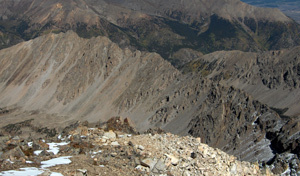 One point about the Northwest Ridge route is that from the trailhead it is 9 miles round trip and gains 4,336'. I had covered about a mile and lost a few feet in elevation so that left me with the full gain to the summit in a short 3.5 miles. And it started now. Looking up a steep hillside in the thick forest of turning aspen trees, the Colorado Fourteeners Initiative had put in a series of log steps gaining about 500'. I don't know if it is cheating but it sure was appreciated! The aspens gave way to thick ponderosa pines as the trail evened out. The trees soon gave out all together as I entered an incredible valley aptly named La Plata Gulch. The nearby creek and lush meadow distracted me from a full view of La Plata off to my left. Once around another small group of trees and there she was. And it felt like I had gained zero altitude. La Plata stands somewhat alone looking from the west. 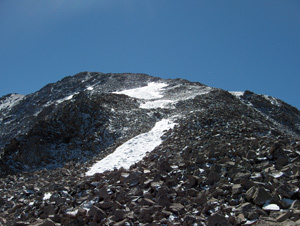 The Northwest Ridge is prominent as was the thin snow layer that told of the previous night's snowfall. 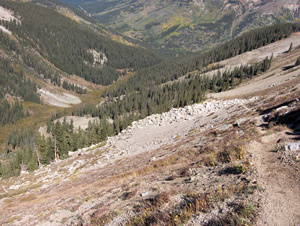 I began the climb out of the Gulch along a series of steep switchbacks which ended at tree line, 11,600'. The well worn trail straightened out as it topped a narrow saddle. For the first time the famous Ellingwood Ridge became visible off to the east. 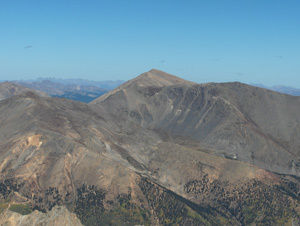 The two mile rugged ridge is an alternate route to the summit and I plan on tackling it next year. But I paused to study it and noted to take a video from the summit. Leaving the saddle the trail loses itself in amongst the boulders below the summit. Carins mark the route here and there but it is fairly obvious where to go and I took the lower paths when presented a choice between climbing and going straight. Soon I was on a flat area between two aparant summits. The one to the north was obviously not it and the one to the south held the prize along with a false summit. A quick climb to the top of the false revealed the true summit compete with the standard rock wind break that previous aspiring summiteers had made. I scurried from the false to the true summit in a few minutes. Where to look is a challenge atop La Plata. Elbert stood clearly to the nouth. Wilson poked her head up way off in the southwest. Ellingwood Ridge laughed at me to the northeast. And hundreds of other Colorado mountain sang their song on this cripsfall afternoon. I took my summit video as usual and started back down via the same route. I really enjoyed La Plata. It is remote and a challenge. The climb is steep and rough in places but nothing over a low class 3. The summit is a true "top" and the view amazing. It was not crowded on this fall September day. I met only seven other people all day. It took me 3.5 hours to summit and 2.5 back down. All in all, an excellent 14er! And a wonderful family! !